Bar Ilan researchers discover enzyme supporting metastatic cells, develop compound to eliminate them. Cancer can often be successfully treated when confined to one organ and there are highly effective treatments for cancers that affect the bloodstream. But a greater challenge lies in treating cancer that has metastasized, or spread, from a primary tumor throughout the patient's body. Although immunotherapy can be effective in treating the metastatic phase of the disease, it is still applicable to a limited number of patients. Bar-Ilan University Faculty of Life Sciences Professor Uri Nir and his team have identified an enzyme that supports the survival and dissemination of metastatic cells, and developed a synthetic compound that targets the enzyme and kills the metastatic cells in mice with cancer. When leaving the primary tumor, cancer cells possess greater tools to survive in very harsh conditions, such as shortage of basic nutrients like glucose. Metastatic cells can safeguard against this metabolic deficiency by reprogramming their energy generation system. Nir and his team found the existence of an enzyme (FerT) in the mitochondria (an organ which generates energy within the cells) of cancer cells that they couldn't find in the mitochondria of normal cells. When they targeted the enzyme in the laboratory, the malignant cells failed to produce energy and died. The team then began searching for the enzyme elsewhere in the body. They detected it in only one specific cell – sperm cells, the only cells in our body which exert their functions outside our body. "Like metastatic cells, sperm cells are unique in that they can also generate energy under very harsh conditions. Once they have entered the female birth canal, where there is no blood supply for them, they produce and expend enormous amounts of energy under very extreme or abnormal conditions," Nir explained. "We found that very aggressive metastatic cancer cells looked for and identified this sperm specific protein, learned how to produce it, and harnessed it in order to potentiate their mitochondria and produce energy under very harsh conditions." Using advanced chemical and robotic approaches, the team developed a synthetic compound which can be administered orally or by injection to animals or patients. 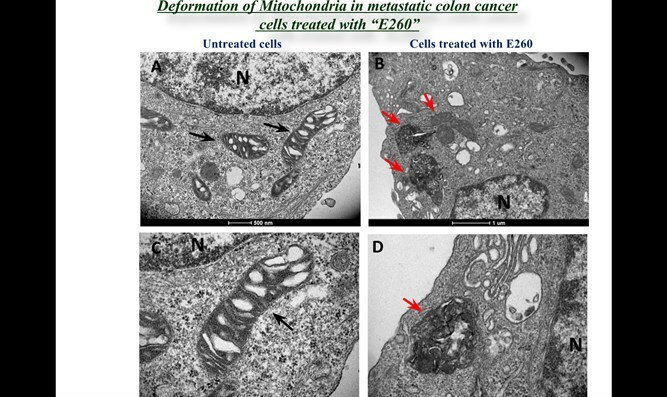 When applied to metastatic cells in culture or mice with metastatic tumor, the compound, called E260, enters the metastatic cells and then into the mitochondria ("power station"). It then binds the enzyme FerT, distorts its activity and, quite notably, not only inhibits its activity, but as a result of the inhibition causes a complete collapse of the entire mitochondria power station. Metastatic cells are very capable, Nir explained. When they identify the damage to the mitochondria "power station," they start to activate a recycling process (termed autophagy) aimed at decomposing and rebuilding mitochondria. This recycling process, however, requires a lot of energy and this ongoing energy consumption leads to a severe energy depletion, metabolic crisis and death of the metastatic. "We have treated mice with metastatic cancer and this compound completely cured them with no adverse or toxic affect that we can see. We have also checked several normal cells and they are not affected," Nir said. Prof. Nir and team have now shown that not only do sperm initiate life, but also carry with them the potential to terminate life. They hope to pursue Phase 1 clinical trials within a year-and-a-half.